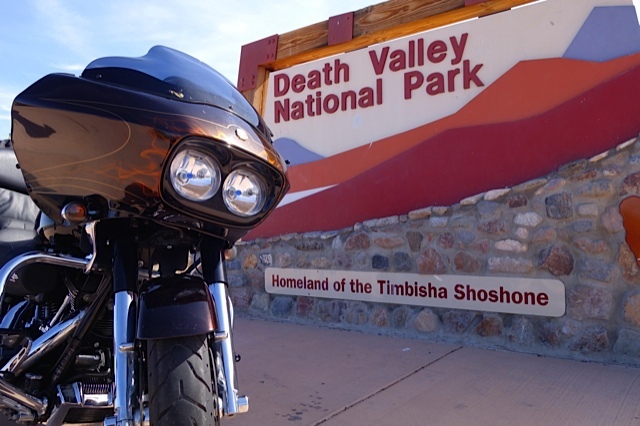 We left the last blog post talking about heading to Death Valley via the eastern entrance and planning to overnight at Stovepipe Wells and ride around the valley floor for a day. When we got up it was 36 degrees in Hawthorne so, we waited for a couple of hours to let things warm up some before pointing our tires at Tonopah which is at the crossroads of US 95 and US 6. There were some dramatic views of the snow-capped Sierra Mountains. The most prominent symbol of a boom-and-bust history in Tonopah is the Mizpah Hotel at the center of the city. Built in 1907 and ’08 on the site of one of Jim Butler’s old camp sites, the five-story hotel was immediately the center of glamour and elegance in dusty, hard-working Tonopah. It had steam heat, electric lights and elevator service, and advertised itself earnestly as “The Finest Stone Hotel on the Desert.” Some trivia about the town is that back in 1957 the reclusive/crazy billionaire Howard Hughes married Jean Peters in room 33 at the L&L Motel in Tonopah. In 1979, after nearly 60 years of decline, Tonopah erupted in its second mining boom of the 20th century with Anaconda’s molybdenum mine north of town. Fleets of buses hauled the men out of town to work. And then one day the boom was over as the market for moly went so bad that even mighty Anaconda had to close down its operation and sit on its $240 million investment. 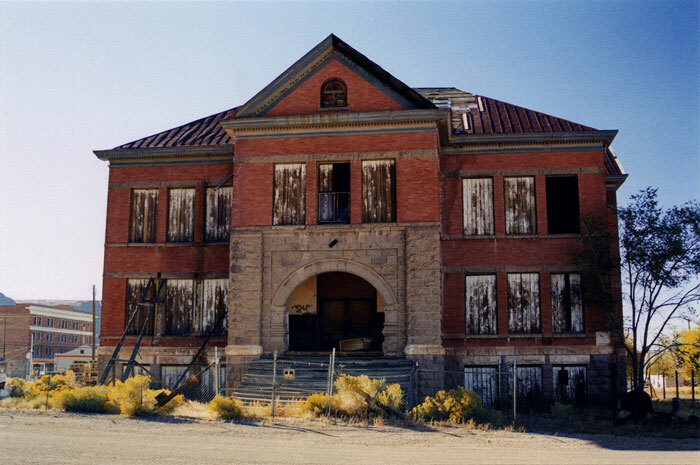 These days the nearby Tonopah Test Range (TTR) is one of the main economic foundations of the town. There are approximately 250 military and civilian workers at TTR conducting aeronautical research and development. It’s located in the northwestern portion of the Nellis Air Force Range in south-central Nevada and its facilities are located approximately 30 miles South East of Tonopah. The F-117 was initially based on the Tonopah range, also known as Mellon Strip, where the F-117 Stealth fighter became operational in 1983. And speaking of ghosts, the next town we rolled through was Goldfield. Gold was discovered at Goldfield in 1902, and it soon became the largest town in Nevada with over 30,000 people. Only 440 people remain in Goldfield now, so it’s kind of a ghost town, but people still pan for gold. The Goldfield Hotel is said to be haunted by a lady of the evening who was chained to a radiator while giving birth by George Wingfield who owned the hotel. She died and her child was thrown down the mineshaft that the hotel was built over. There are many web sites that talk about how you can see her in room 109 and hear her baby crying on dark nights. 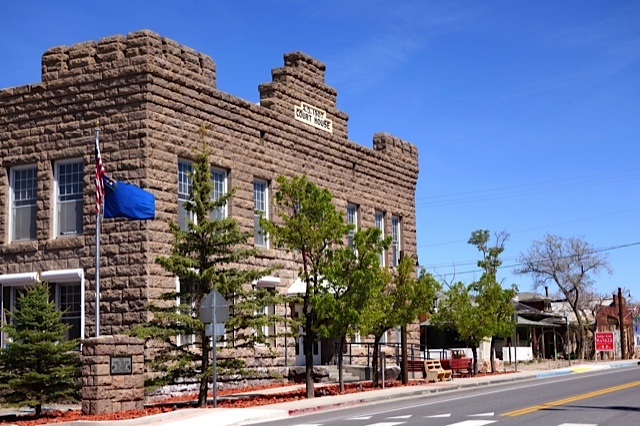 The massive old high school now stands empty and is falling down, and the castle-style Esmeralda County Court House is an architectural curiosity of the Edwardian variety, is open to visitors. Inside are the original Tiffany lamps and there is a plaque on the outside of the building about the 1902 prize fight for the Lightweight Championship of the World between Battling Nelson and Joe Gans. It was hailed as “The Fight of the Century” and the biggest purses in the history of prize fighting: $20,000 to the champion Nelson and $10,000 to Gans, the black challenger. The fighters battered each other for 42 punishing rounds before Nelson, bloodied and sagging, fouled Gans in a clinch. 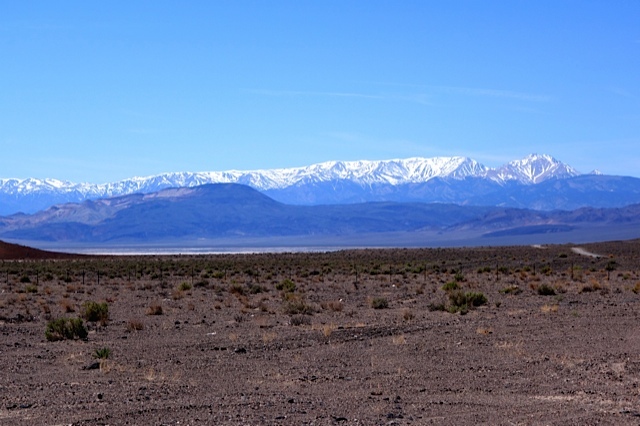 At Beatty, NV we headed West on Highway 374 then pointed tires onto Highway 190 as we dropped down into the northern part of Death Valley into the small way-station of Stovepipe Wells. 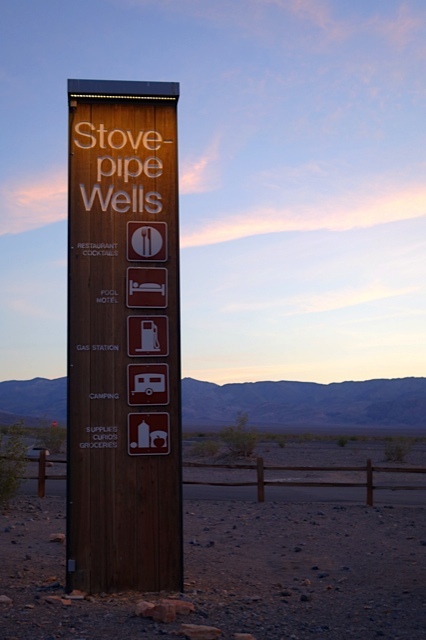 We got one of the last rooms at Stovepipe Wells Village Hotel which offered up terrific views of Mesquite Flat Sand Dunes and the surrounding mountain ranges. The people were nice, but the restaurant wasn’t anything special and the room was like a low budget Sturgis motel that included the room rate overcharges. The rates only went higher at other locations and we were glad to have a place to throw some bags, take a shower and have some refreshments. It was interesting place to take in the dark night sky and try to find satellites and the various planets with the naked eye passing overhead. It’s one of only a few places in the world where you can do this. All the cold weather in the region turned out to be a blessing down in Death Valley. The temp’s were in the mid-80’s and we enjoyed some very nice riding in the desert. 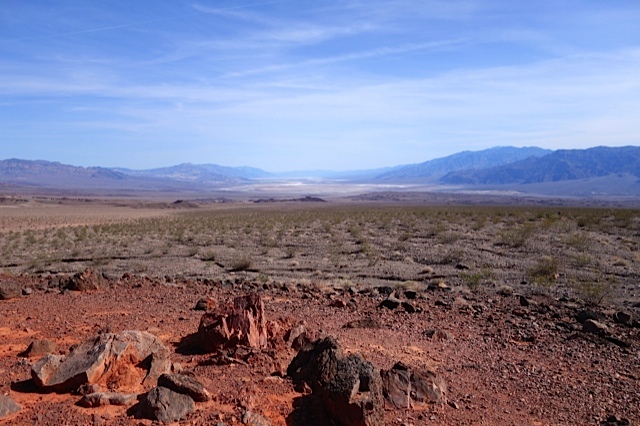 The experience the next day was a mix of desolate desert landscape along with the Furnace Creek oasis which opened in 1927 by the Pacific Coast Borax Company. These days it has the world’s lowest golf course at 214 feet below sea level. We rode out to the Harmony Borax Works that processed borax ore in the late 1800’s and looked at photo’s of Twenty Mule Team wagons that hauled the ore to the railhead 165 miles away. We also rode into the area called Artist Drive. It’s an impressive place with all the multi-colored claystones from ancient ashfalls that generate the different colors formed in the mountain. 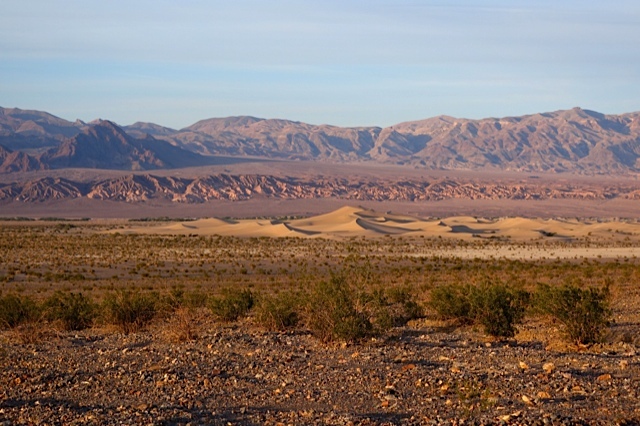 Death Valley is over 3 million acres of designated wilderness and includes hundreds of miles of trails in all directions. The terrain is as varied as it is extreme, from vast sizzling desert and rocky canyons to historic sites and snow-capped peaks. We enjoyed riding around the desert floor, but it was mid-afternoon and time to leave the valley. We pointed the tires south and proceeded toward Las Vegas via Pahrump, an “RVer’s Paradise” that is easy to reach and easy to forget. As we got closer to Vegas the Red Rock Canyon lit up with the afternoon sun making me wish for a few more hours to visit and photograph, but we needed to cover the next 110 miles in time to meet up with the rest of the “Wolf Pack” aka the riding posse in Laughlin for dinner. 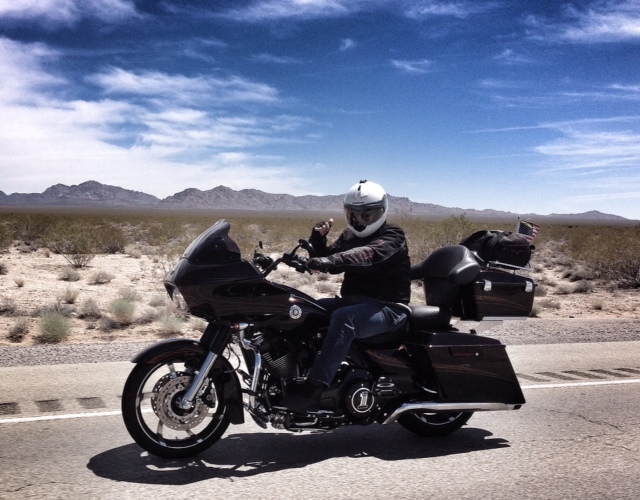 Sure, the rain and cold during the first 5 hours of the ride were hideous, but overall the ride didn’t feel rushed and in taking three days to ride down to Laughlin it allowed us plenty of time to see some terrific scenery and experience the various environments. I’ll avoid doing an in-depth summary of the Laughlin River Run event. We’ve all been out to Oatman and have the “been there and done that” t-shirt. 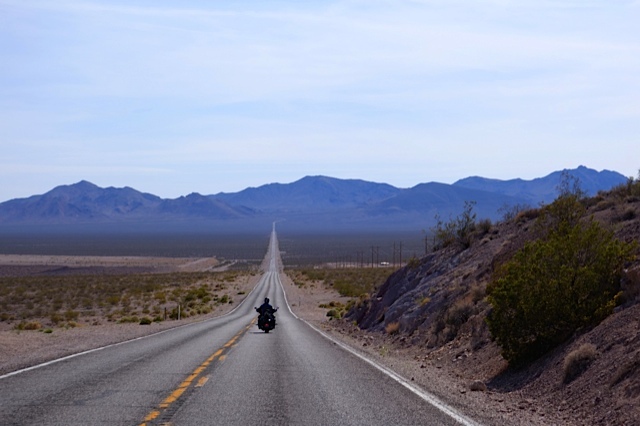 A Mohave Daily News report stated there were more than 45K bikers in town. I think that number was inflated because cruising down Casino Drive just didn’t have the same clogged feel as previous years. The good news is no motorcycle-related fatalities as part of the event were reported. One item I want to mention was the Friday night BBQ near Needles. The posse attended the annual “Dave’s BBQ” on the Colorado River. He pulls together a high quality event each year for the folks visiting Laughlin that includes grilled shrimp and tri-tip and everyone is hooked on the luscious dishes from chef Manny. We were all licking our fingers and asking for more. A big shout-out and thanks to the BBQ crew for pulling it all together! It was great to see everyone and the BBQ was one of the highlights of the trip. Rather, the smothering dome of high pressure from Montana to Arizona that has immersed the northwest in a heat wave. The nighttime heat is especially excessive. 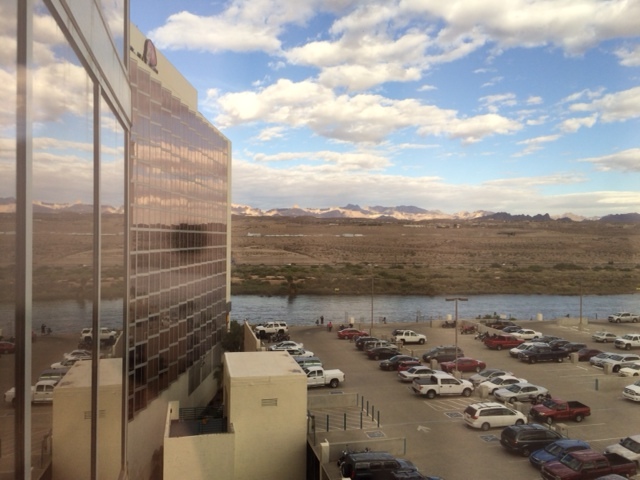 And as I read about the numerous river rescues over this past weekend a story about how the mercury rocketed to 129 degrees in Death Valley National Park, which tied the record for the hottest June day anywhere in the country and reminded me of a trip to Laughlin River Run. 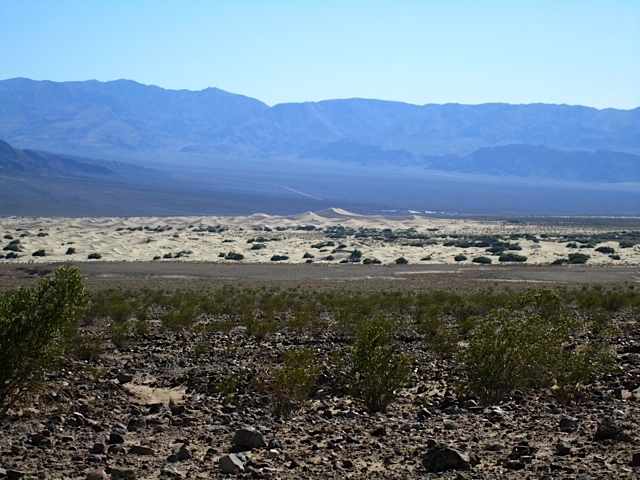 I wasn’t certain, but the highest temperature ever recorded on earth was 134 degrees in Death Valley in 1913. 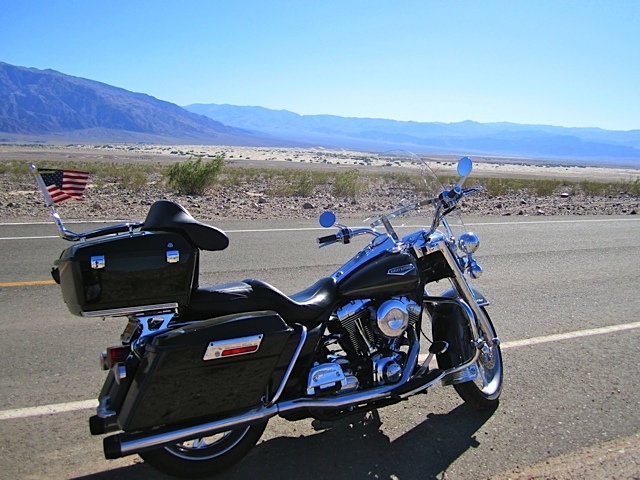 At any rate, we were headed to the Laughlin River Run and rode through Death Valley a couple years back (HERE). It was the end of April, but it was hot below sea level! We entered Death Valley from the West entrance on Highway 190. We traveled east and there was flat and spectacular scenery with sculpted hills and shifting sand dunes. We went from high level vistas to the below sea level and enjoyed the hottest place in the U.S.
About 20 miles into the park we stopped at Father Crowley Point and ran into a group of riders from Germany. We made another stop at Stovepipe Wells village for a photo opportunity of Mesquite Flats Sand Dunes then headed east on Daylight Pass Road to Beatty, NV. It’s an immense area and we were in route to Las Vegas and spent little time standing still experiencing the dry heat. I’m not a fan of riding in extreme heat and the Harley seems to have no “issue” producing high levels of engine heat even on a cool day so 100+ degree ambient temperature just adds to the discomfort. I’ve tried mesh jackets, t-shirts and leather jackets with vents adjusted wide open. Very little relief from evaporative cooling occurs and I’ve learned to just carry much more water than is typical. Photo’s taken by author. 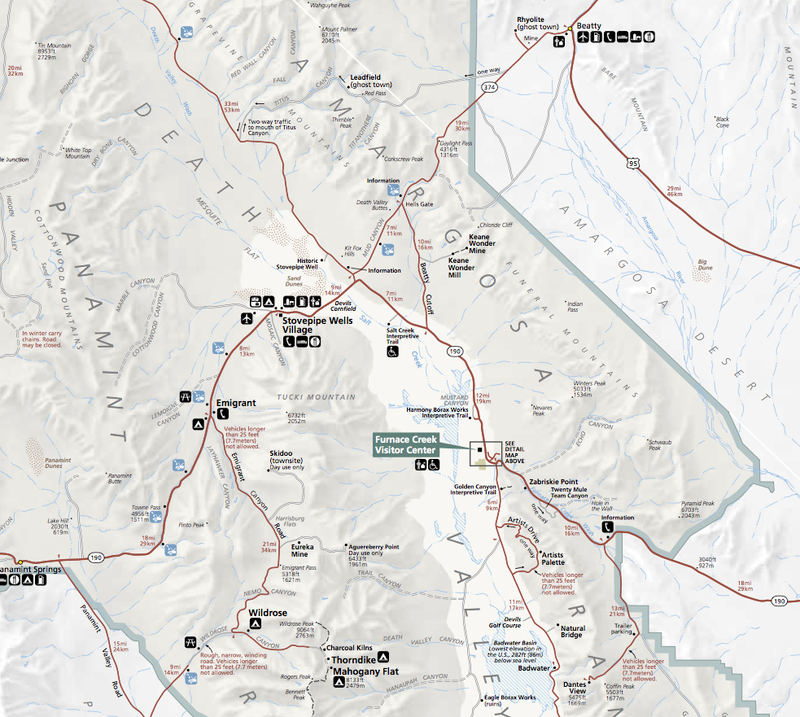 Map courtesy of Death Valley Nat. Park.